Stuart Mackenzie was among dozens of locals who turned out at the Labour politician's 100 tour in Kirkcaldy. An independence supporter hurled eggs at MP Jim Murphy during a speaking tour because the former Scottish secretary refused to answer his questions. Stuart Mackenzie was among dozens of locals who turned out at Mr Murphy's 100 Towns in 100 Days tour in Kirkcaldy last week. But when the Labour MP for East Renfrewshire failed to answer the question "what do you have against democracy" posed by MacKenzie, the 45-year-old decided to take action. He walked to a nearby Tesco store and bought half a dozen eggs before returning to the Fife town's High Street, where tensions between Yes and No supporters were running high. Mackenzie then hurled his first three eggs at Mr Murphy - missing each time. Jobless Mackenzie then re-positioned himself and tried again - missing from four yards' range - before approaching the MP and "physically striking him" with the eggs before making off. Mackenzie's lawyer said he lives in a flat overlooking the scene and had gone to watch Murphy's speech after "hearing the commotion". David Cranston, defending, said Mackenzie was a supporter of Scottish independence, and had lashed out because of a "lack of interaction" with the MP but said he did not condone "organised, concerted disruption" of the politician's campaign trail. On Thursday Kirkcaldy Sheriff Court heard Mackenzie handed himself into police on Wednesday after massive media coverage of the incident. Fiscal depute Cheryl Clark said: "Police were called anonymously because of concerns the event had become heated and the crowd was rowdy and disruptive. "CCTV was turned on the event and it was monitored. 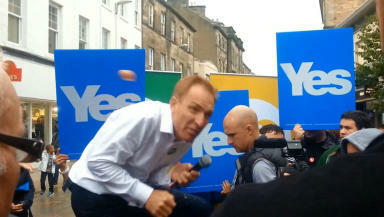 "Around 3.35pm the accused was within the crowd being addressed and he was seen to throw an egg towards witness Murphy. He does this a further two times, missing each time. "The accused then positions himself behind witness Murphy and misses again. "He then approaches witness Murphy and physically strikes him directly on his back. "When he was charged the accused said 'I'd like to apologise to Mr Murphy and for bringing the Yes campaign into disrepute unintentionally'. "He said he was thoroughly ashamed." Mackenzie, 45, of High Street, Kirkcaldy, pleaded guilty on summary complaint to a charge of assault. David Cranston, defending, said Mackenzie was a supporter of Scottish independence. He said: "He recognises that this was shameful behaviour. "He lives overlooking the scene and went down to take part and ask Mr Murphy a question. "He was irritated that he didn't get a response and there was an altercation with a photographer who he thought he was an official photographer and he got in a bit of a state. "He's not part of any concerted attempt to disrupt meetings by Better Together and if there are concerted efforts he wants no part of them." Sheriff Kenneth McGowan ordered Mackenzie to carry out 80 hours of unpaid work on a community payback order. He said: "We are very fortunate that we live in a stable democracy where political discourse can be taken freely without risk of violence or disorder. "From time to time passions may become inflamed especially when there is a major political event carrying on. "These were really childish antics. My main concern is that this took place in front of a large number of people and it could have triggered disorder. "You would have had no control over it and it could have got out of hand." Mr Murphy, the Labour MP for East Renfrewshire and former Scottish secretary, suspended his tour following the incident, claiming he he had suffered from "co-ordinated" and "aggressive" Yes supporters creating a "mob atmosphere" but resumed his public speaking on September 3.